Work experience student Holly recently spent one week with us at Tea Tree Gully Library. Not only did she learn about the library and all of the work that goes on behind the scenes, she also learned a lot about herself. ‘Hi, my name is Holly and I attended work experience at the Tea Tree Gully Library. I am going to be writing about stepping outside of your comfort zone. What types of qualities do you need to step outside your comfort zone? Courage? Bravery? Persistence? Resilience? I think they pretty much cover it. This year, I have had to deal with stepping outside of my comfort zone a lot. I still am. Is it easy? No, of course it isn’t. A way to help me through a confronting situation is to think about the positive outcomes. Stepping outside of my comfort zone makes me more confident and independent in the long run, even if at the time I am really nervous or freaking out about it. I know that if I do the certain activity, I will be better off for it. One instance of me stepping outside of my comfort zone was whenever I had to deliver a speech to my class. Sure, it doesn’t seem like a big deal, but I can’t help but get nervous. When I get nervous like that, my hands shake and I talk really fast. I am sure that’s common. However, the more times I get up in front of people and talk to them, the more confident in speaking I will become. Over the year, I have gotten better at speeches in front of people. There is still room for improvement, but practice makes perfect. In all honesty, I don’t mind delivering speeches, but my shaking hands and pounding heart suggest otherwise. It must be a subconscious thing. To get rid of this subconscious worry, I will need to face the anxiety head on by delivering speeches. The more I do it, the more comfortable I will feel, which will decrease my nerves. I hope that in the next couple of years, I will get even better at public speaking. Another instance of me stepping outside of my comfort zone is performing in front of my drama class. Don’t get me wrong, I love drama, but sometimes doubt seeps into my mind. What if I’m not good enough? I bet everyone else is better than me. This is so embarrassing, I look ridiculous! I don’t even want to know what people are thinking of me right now! Those are some of the thoughts that whirl through my mind as I try to perform. This results me in getting very nervous, my hands shaking, my heart pounding and me speaking my lines way too fast. Sometimes, my performance levels will drop because I’m too scared that I will look ridiculous. If I am holding a prop, it will be very obvious my hands are shaking. I have to do a monologue in drama for my exam in a few weeks and I find it very difficult to rehearse it in front of everyone, as my character gets a little crazy. However, the more times I do it, the more times I step out of my comfort zone, the easier it gets. My confidence has built so much since my first drama lesson this year. My teacher has noticed it too. I now can rehearse my monologue or other parts of the script without the nerves or fear of people watching me. Again, there’s still room for improvement, but if I keep persevering, I will get there. I love drama and wish to continue it throughout school and maybe even after it, so if I can build my confidence, which would enhance my skills, that would be amazing. One of the biggest examples of me stepping outside my comfort zone is when I volunteered to go to my school’s Sri Lanka mission trip. At first, I was just very excited. I haven’t really been overseas before, aside from a cruise to the Pacific islands with my family. I have never been on an international flight. I haven’t been that far from home before. This would be the longest time away from my family and most of my friends. As the time got closer, I started to feel more nervous, doubts creeping into my mind. It was feeling a lot more real to me now. What if I couldn’t do something that the team wanted me to do while I was away? What if I humiliated myself? What if something goes wrong? What if people in the team didn’t want to talk to me? What if I became lonely? What if the kids at the homes don’t like me? These questions were clouding my mind, making me feel more anxious about the trip. Even with all of my doubts, it didn’t stop me from wanting to go. I still wanted to make a difference to the kids’ lives. I leave for Sri Lanka this Sunday, which is both exciting and scary. I need to step outside of my comfort zone and deal with any problems that come my way the best that I can. I have pushed out all of the negative thoughts and try to focus on the positive. Just because it’s a new situation doesn’t mean that it will be bad. The most recent instance, which also includes the time that I was writing this, is my work experience. I applied to the Tea Tree Gully Library. I thought it would take a while for them to contact me, but it only took about a week or two, which was a pleasant surprise. I have to be honest here. I, like almost the entire Year 10 cohort at my school, did not find a work experience placement at the start of the year when we were handed our forms. My reasoning was that the places I already looked up either didn’t accept Year 10’s, didn’t have the correct days, or already had work experience students. I am glad that someone suggested I should try the library, as I do like to read myself. It’d be interesting to see what is going on behind the scenes of a library. Right up to the moment I stepped into the library, I was feeling extremely nervous. I had no idea what to expect or where to go. The same could be said for the interview process. I was worried because I had just come from school and was still in my PE uniform! I had wished I had time to change. At least when I went into the work experience week, I had time to make myself look presentable. Once I got to the council, one of the librarians came and got me and brought me down to the work room. This was when I was most nervous, but I pushed through it and carried on. There were a few little introductions. I knew I wouldn’t remember anyone’s names straight away because I am not really good at names. Michele talked me through the introduction to the library and gave me a tour. I started to feel more relaxed, but I still felt a little bit nervous. Soon enough, I got into some work. I started off at the chute with Chris G. I enjoyed it, especially since I got to know Chris a little bit better. I think that’s what I like most about each job. I get to talk to and learn more about the workers here at the library. This helped me feel more relaxed. My favourite job on Monday was probably being at the customer service desk. You can interact with customers as well as the staff around you. Even though checking in lots of books and sorting them into the right boxes and trolleys may seem tedious and a little boring, I didn’t mind it. I found myself getting into a rhythm. By the end of the first day, I was really tired. I wasn’t used to this type of work day. I went home tired, but looking forward to coming back for the next few days. On the Tuesday, I had to find my own way to the library, so I decided to take a bus, which is something I don’t normally do. I really didn’t want to get there late because there was a staff meeting, so I decided to get an earlier bus than I had planned. I was a little nervous, but I decided to step out of my comfort zone and have a little faith in myself. It was the right choice. I got to the library in plenty of time. The staff meeting was right at the start of the day and I had a chance to look at all the staff, as I had not met everyone yet. My favourite activity of the day was helping run the ‘Facebook/Messenger on your tablet’ session. Even though I don’t use either application myself, I managed to help some of the people in the session, which was great. This session was a lot different compared to the other jobs that I had done so far. I even learned some things from attending that session. Just like the first day, I put 100% effort into everything I did, even with the more tedious tasks, like labelling wine bottles. On the Wednesday, I caught the bus again, but I decided to catch a slightly later one. I still made it to the library in plenty of time. The first task I did was to find the expired holds. There wasn’t too many to do, so I spent about 45 minutes also just shelving books. After morning tea was the fun part. I got to attend the ‘Baby Bounce’ and ‘Toddler Time’. A couple of staff members and myself sat in the corner of the library in front of a crowd of kids and their parents. The 10:30 session was for babies and the 11:30 session was for toddlers. What we had to do was sing songs to the kids and do the actions to them. I was nervous and uncertain about it at first, but I quickly got into it. These sessions were something that I have never done before, but I really enjoyed them. The little kids were so cute! I then spent a couple of hours at the customer service desk. I got into a steady rhythm. After the customer service desk, I had some time to continue this blog. While I was working, one of my school teachers came to see how I was going. We had a quick chat about what type of jobs I was doing. I then went back into the work room to continue writing. After the allocated project time, I attended an early development and index meeting with Holly, another librarian. Throughout the week, it would be disorientating when someone would call my name, but not be talking to me. I have rarely come across someone with the same name as me before. During the meeting, there was a power outage, so a lot of people left early, including me. It turns out the whole state had a power outage. On Thursday, I started the day by doing holds. However, I only had time to do a few because at 9:15am, there was a morning tea for a staff member’s birthday. That lasted until 10am. I then went to help David for a couple of hours around the library. After that, I did some of the pick list with Stephen. I then spent another couple of hours in the toy library, which was interesting. It was good to interact with Lyn and the volunteers there. After that, I went back to the chute for a while with Pam. We also managed to do some of the pick list as well. To finish the day off, I had more time to work on my blog. On Friday, my last day of Year 10 work experience, I came into the library early once again. It gave me time to look over my schedule. I started the day by doing some admin with Nicolle. It was a little bit confusing, but if I had more time for it, I am sure that I would have got it. I then went to story time with Kim and Julie. I listened to them read stories to the kids, helped hand out the crafts stuff and joined in with any actions for the songs. The kids were really cute and excitable. After story time, I went back to help Nicolle with admin. After lunch, I worked in the chute and customer service desk one last time. At the end of the day, I had a final catch up with Michele to talk about the week. Now that the week has ended, I can say that I’m glad that I applied for the library. It gave me a good variety of tasks. It would probably be boring if I did one thing for the whole week. Work experience in general is a great way for kids to break away from their school life and have a glance at the real world. It may be outside of their comfort zones, but it does prepare them to do well in their futures when they do have full time jobs. Work experience gives you more independence and confidence, so I definitely recommend you doing it. Tea Tree Gully Library is a good option if you are unsure of where to go. It gives you a taste at a range of different jobs. Hello dear Reader, my name is Danielle, and I am from Our Lady of the Sacred Heart College. For one week, I used my time to gain knowledge on how a professional and working environment functions and to learn and assist around the Tea Tree Gully Library. 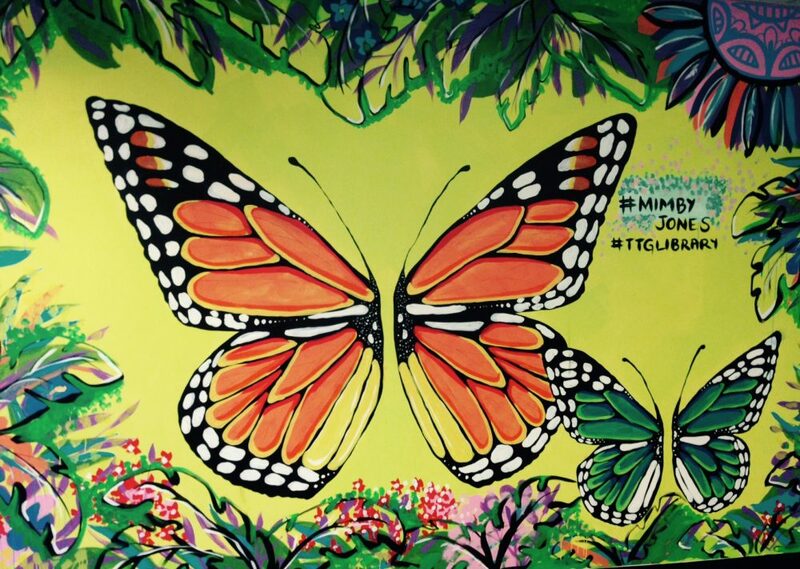 As part of my Work Experience, I have been given the task of writing a blog post for the Library website (which is what you are reading now), and after considering many topics and ideas I have decided to write about the wonderful community here at TTG Library and how much the staff value those who come to visit. I hope you enjoy reading! So on my first day, I began the week by helping “behind the scenes” of the library, such as in the Chute Room (where books are returned on a daily basis) as well as the Customer Service Desk, however, my first interaction with the public was when I helped Jessica and Natalie during “Toddler Time”. I enjoyed being around the younger audience and I loved how comfortable the kids were around Jess and Natalie. Even just joining in with singing the nursery rhymes was a fun and relaxing way to spend the hour, with two wonderful ladies. Later, I spent time in the Toy Library, which was filled with dozens of toys ready for the children before the holidays. Natalie reading to the children at Story Time! Next up, we have ‘Cover 2 Cover’, a book club run by Kim where young adults (like those who are teens) can come and be a part of the Library activities once every month. This week in ‘Cover 2 Cover’, the group discussed a recent book that they had been reading named “The Enchanted”. Written from the perspective of a man on death row, the novel followed many complex themes and metaphorical twists. I found it very interesting, seeing the discussion between those who were there and joining in with answering questions that related the topic of the book and to events in the real world. Being in Year 10, I definitely liked being able to spend my time with others close to my age and who also enjoyed my passion of reading. ‘Cover 2 Cover’ is now preparing for the Inky Awards, and so, I would definitely recommend the club to anyone who loves discussion and books and I will definitely try to attend another meeting! During my time at TTG Library, I also noticed the enormous effort that the staff and those who work here put in to ensure the Library runs smoothly for the public. From hosting introductions about new technology, for those who wish to learn, attending presentations that provide information on new changes with social media (regarding the younger generation) and even just maintaining the library to make certain that anyone is able to easily access what they want. After seeing the positive attitude here at the Library, small gestures such as being able to help with providing assistance to someone on the computer or aiding with the self-checkout machines for borrowing were tasks that I was happy to help with. Towards the end of my week, I was also given the chance to assist Penny with updating the Library website. During this time, I was given a run through of some of the tasks that Penny was assigned to perform and once again, I was amazed with how meticulously she was able to keep the website up-to-date in order to guarantee that any members of the library can definitely find what they need. We also experimented with different software such as Adobe InDesign, Illustrator and Photoshop and the content management software, Seamless. I would like to thank the staff who have made my week of Work Experience so enjoyable, especially those who acted as my buddy throughout my time here. I am incredibly grateful to those who helped me, especially on my first day as even though I was slightly nervous, you taught me to adapt to the environment here at the Library, which in turn allowed me to have a very successful week! To Kerry, Heidi, Deborah D, Lyn, Taylor, Nicolle, Sonya, Tegan, Stephen, Adrienne, Michele, Linda, Kim, Tricia, Chris G and of course Bronwyn: THANKS ONCE AGAIN! Young and passionate about reading? And writing? Read books you love. Or hate. Or have never heard of. With other young people. Tea Tree Gully Library’s youth book club Cover 2 Cover encourages passionate debate and discussion on all kinds of books. The group meets on the 1st Wednesday of each month, from 4.30-6pm and is free to join. Cover 2 Cover members receive extended borrowing time on items, money to spend on new books, opportunities to write book reviews for library customers and delicious snack food at each meeting. The atmosphere is casual and relaxed, with a strong emphasis on reading for pleasure. Guidance on texts and required reading for school and university can also be provided. For young writers, Raven’s Writing Desk is the library’s youth writing group, who meet on the 2nd Wednesday of each month from 4.30pm. Raven’s Writing Desk is also held in a relaxed environment. Members are encouraged to share their writing with others in the group to gain honest feedback and their creative written style can be appraised and developed with the help of the group’s facilitator, an English teacher. Book recommendations, inspiration for writing and tips on getting published are shared at monthly Raven’s Writing Desk meetings. Members also receive extended borrowing time on all items. One Of The Best Video Games I’ve Experienced Is Undertale. Austin was recently here with us for a week’s work experience at the library. He is a passionate gamer, and has written a review about a new release PC game, Undertale. What is Undertale? You may ask, why do I hold it in such high regard? These are just two of the many questions you may be thinking of right now as you read my blog post about this absolutely fantastic video game. Undertale is a RPG (Role Playing Game) for the PC which is almost entirely made by one person, a guy by the name of Toby Fox. A major selling point of Undertale is its tagline which is ‘The friendly RPG where nobody has to die’. This is a major selling point of the game, because in most RPGs you strike down enemies with no care whatsoever, as who you are fighting is evil. Undertale on the other hand, gives all of its enemies such fantastic personalities through their dialogue and even their attacks against you. Speaking of enemies, I’ll briefly talk about the battle system in Undertale. To start with, there’s an Attack menu, an Act menu, an Item menu, and a Mercy menu. I’ll be talking about the Act menu and the Mercy menu. The Act menu consists of various actions you can do to try to get the monster to not want to fight you; these are different for every monster in the game. The Mercy menu is for when you basically say you don’t want to fight, and most of the time this won’t work unless you use the Act menu to figure out how to convince the monster to not want to fight you anymore. Where Undertale really shines the brightest is through its story, writing and humour. Undertale is best experienced without knowing much about its story, so I won’t go into details but I will say this so you know what you’re getting into. A small child enters a cave in the mountains, trips and falls down an enormous hole. The child wakes up on a bed of flowers in a mysterious place. A word of advice before thinking of purchasing the game would be that from screenshots of the game it can look quite ‘kiddy’ but don’t judge it on its looks – there are times where the game deals with some dark and sad themes. To conclude, Undertale is an absolutely fantastic video game and I highly recommend you check it out at the very least, if you do not purchase it. (Undertale is available for purchase on the Internet-based digital distribution platform Steam and undertale.com for $10). Work experience student Emma was initially apprehensive about her placement at Tea Tree Gully Library. But she soon discovered she had nothing to fear, as she enjoyed the tasks and working in a team. She shares her account below. I can’t be dishonest. My initial thoughts about work experience were all unsure, nervous, and overall I was rather afraid to participate. After walking through the door of Tea Tree Gully Library, I’d completely changed my mind! Those thoughts became excitement after meeting the community – the environment was friendly and welcoming and made me look forward to arriving each day. I found there was quite a large variety of activities for me to do during my time there. Working at the CSD turned out to be far more enjoyable than I thought it would be. Even though scanning and sorting might sound tedious, I felt good about being able to contribute to this amazing community. The sensor pad also captured my interest – you can place a number of books on it and they will all be scanned at the same time. Alongside this was work at the Info Desk, as well as dealing with shelving and holds. Placement orders seemed difficult to understand at first, but once it was explained, I got used to it quickly. Working in the chute was very similar to the CSD, the only difference being that it worked as a 24-hour collector (as people can return books and CDs after-hours). I also helped out during Story Time for toddlers. After reading the story, we allowed them to do a colouring activity. There was never a point where I sat down and felt bored. There was constant movement in the library, and always something to do. If there was too much work, someone would come in to help. It is a system that relies on teamwork. By the end of it all, I can proudly say that I am happy I took part. The more you read, the easier it becomes. But for those who struggle with words, reading is not always fun, and it’s easy to lose heart and stop trying. 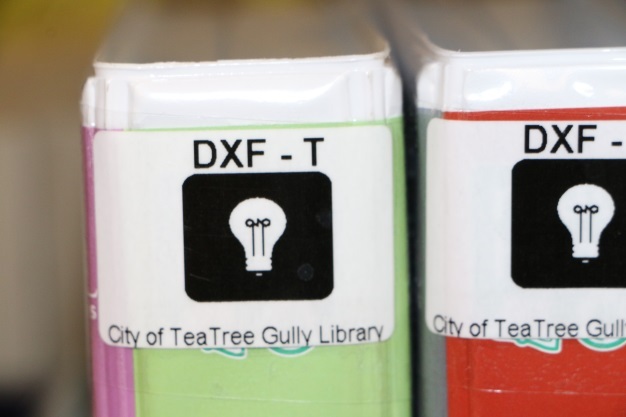 Tea Tree Gully Library has recently made it easier to find dyslexia-friendly books and audiobooks by putting them in their own space in the children’s and teen areas. They now have signage and coloured labels so they are easy to find. 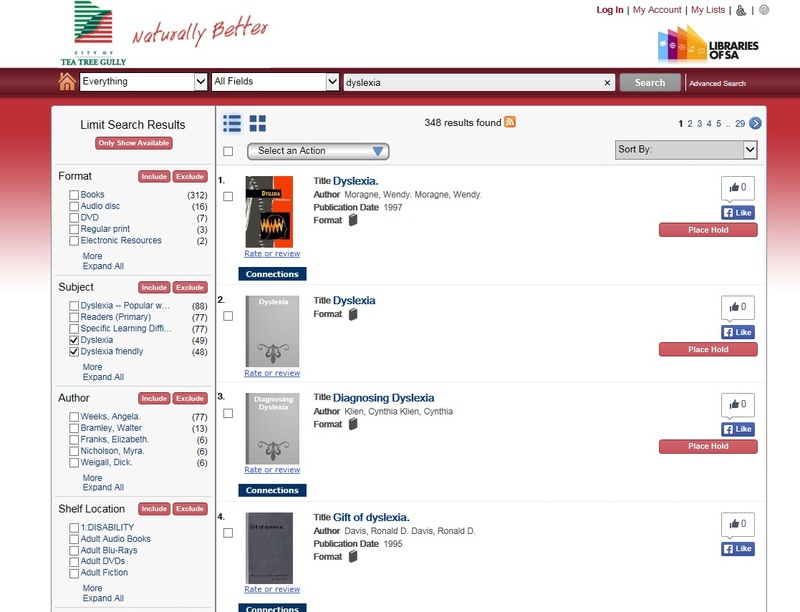 To search for dyslexia friendly books, type in ‘dyslexia’ in the catalogue, just like below, and from there you can select the ‘dyslexia’ boxes on the left-hand side. Dyslexia primarily affects the ability to learn, read and spell. Sometimes maths is affected as well. It’s important to remember that having dyslexia is not related to someone’s general intelligence. It comes from a difficulty in dealing with the sounds of words. 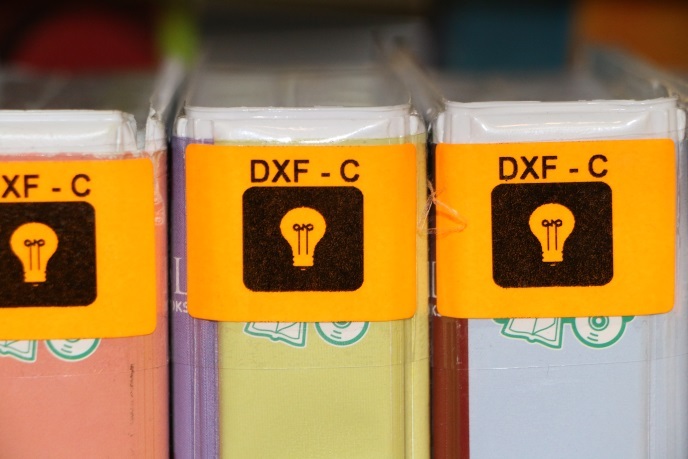 People with dyslexia often find it hard to remember lists of things they have heard, or to remember names or facts quickly, although they often have strengths in reasoning, visual and creative fields. A font style and size that is clear to read. Off-white paper that is kinder to the eyes as it reduces glare from the high contrast of black against white. Children’s Area: Find them in the area near the book series boxes. 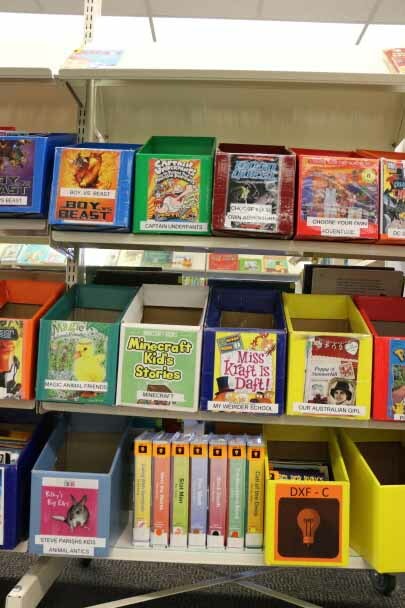 You can find dyslexia friendly books and audio books among the Children’s book series boxes in the Children’s Area. 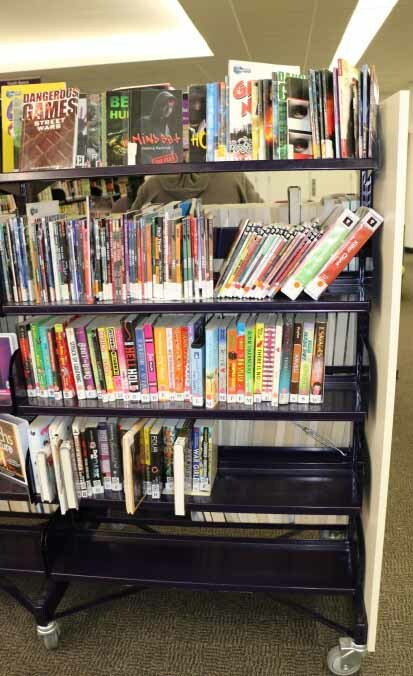 Teens Area: You can find them on the last shelf facing the public computers. Find the DXF-T books in the shelf that faces the computers (in the Teen Area). We hope our new collections appeal to children and young people who have dyslexia or who are reluctant to read. May they inspire a new love of reading!